The European Union ranks as the world’s second-largest economy by gross domestic product, but few people globally see it as an economic leader ahead of China or the United States, according to a recent Pew Research Center survey. Across the 38 nations in the survey, a median of just 9% view the countries of the EU as the world’s leading economic power. By comparison, 42% name the U.S. and 32% name China, while an additional 7% name Japan. The comparatively low international rating of the EU’s economy comes despite its economic power – at least as measured by gross domestic product in purchasing power parity dollars (i.e., exchange rates adjusted for differences in the prices of goods and services across countries). By this measure, EU member countries collectively generated $20.3 trillion in GDP. The EU trails only China and ranks ahead of the U.S. and Japan. As recently as 2014, the EU outranked all other countries in terms of GDP, but even then, few people globally cited it as the world’s top economy, according to earlier Pew Research Center surveys. The country most likely to name the EU as the world’s top economy in the new survey is Germany, itself the world’s fifth-largest economy by GDP. 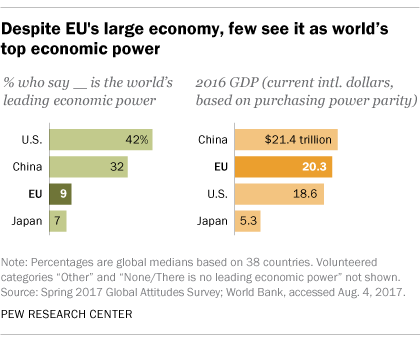 Still, only one-in-four Germans say the countries of the EU are the world’s leading economic power, compared with 41% who name China and 24% who name the U.S. The only other European countries where one-in-ten people or more see the EU as the world’s top economy are the Netherlands (13%) and Poland (10%). Outside of Europe, other countries where at least one-in-ten name the EU include Jordan (15%), Tunisia (15%), Colombia (14%), Vietnam (14%), Canada (11%), Mexico (11%), Tanzania (11%) and South Africa (10%). 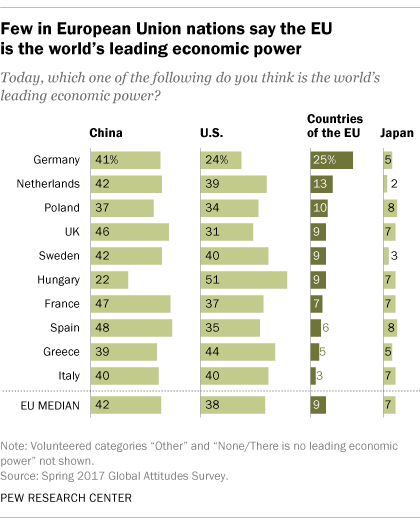 Only 3% of Italians see the EU as the top economy, while a slightly larger share (7%) name Japan and about four-in-ten each say the U.S. or China. And just 5% of Greeks cite the EU or Japan as the leading economy, while 39% name China and 44% say the U.S. No more than 5% of Italians or Greeks have ever named the EU as the world’s leading economy since the question was first asked in these nations in 2012. Countries outside the EU where 5% of people or fewer say the EU is the leading economy include Nigeria (4%), Lebanon (3%), Senegal (3%), South Korea (3%) and India (2%). The Japanese, much like Europeans, tend not to see their own country as the world’s top economic power. Just 7% of Japanese say this, and Japan does in fact rank behind China, the EU and the U.S. in GDP.